Our doors will be open from 6pm - 9pm, for an evening of canapés, live music and a chance to experience the magic of Haarlem Mill at night. Come and experience what a real wedding might feel like at this cool, urban industrial styled wedding venue, Haarlem Mill. Whether you've already booked your big day here or still looking for that perfect venue, we would love for you to see the banquet room aglow with candles, our beautiful festoon lights at dusk or the relaxed ambience of live music in our gin bar. See a photographer in action, a photo-booth full of crazy props and the bridal suite ready for a morning of bridal preparations. Our brilliant team will be on hand to answer any questions and offer advice, in a relaxed and informal evening... and most importantly our canapés will be on offer and the bar open so why not make an evening of it. WHY CHOOSE AN INDUSTRIAL STYLED WEDDING THEME? Industrial styling is one of the most popular styles in weddings right now with so much versatility and lots of mix and match opportunities, it offers bucket loads of inspiration to couples who are keen to get away from the traditional wedding ‘look’ and ‘feel’ and go for a theme that’s cool and reflects their own style. With more and more couples turning to Instagram and Pinterest for inspirational images to plan their day, it’s hardly surprising that this super cool theme is a big hitter this year. 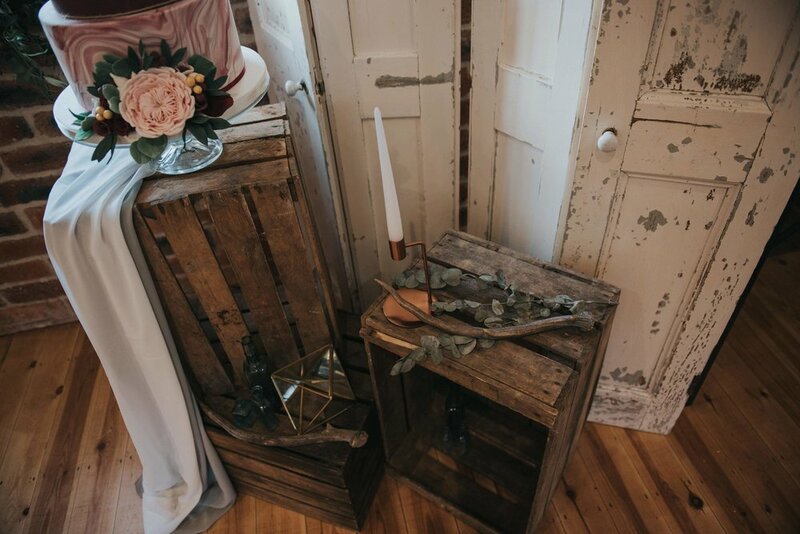 It not only looks great, but is surprisingly easy to add a lot of small industrial details to your already industrial styled wedding venue or overall theme. Exposed red brick walls, structural metal beams, timeworn wooden workbenches – these are the hallmarks of industrial chic style, especially when coupled with exposed Edison bulbs. Did we mention it’s super hot for weddings right now? If you want to perfectly balance contemporary city style and industrial influences but still strike a romantic note with your finished reception décor, then this might be the perfect theme for you! An obvious way to have an industrial styled wedding is to choose an industrial venue. Failing that, here’s how to source the industrial chic style for your own big day. Wedding signs double up as beautiful decorations and backdrops as well as sometimes having a practical use. To introduce an industrial chic twist, aim for signs with reclaimed wood effect planks and letterpress-style type. 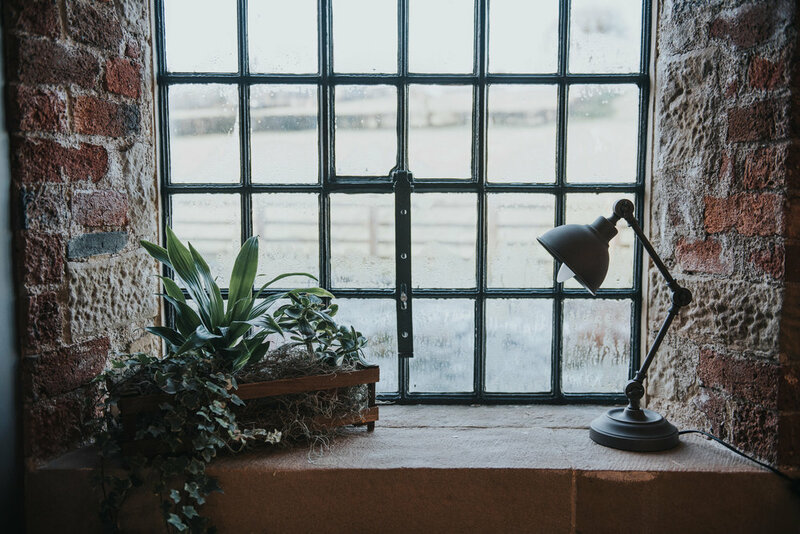 A little wear and tear will add authenticity, so embrace any knocked corners, peeling paint and marks. A stack of old crates decorated with empty gin bottles, greenery and candles fills an large empty space beautifully and is quick cheap and easy to do it yourself. Collecting the gin bottles can be a lot of fun too! Somewhere in your industrial chic décor you must include metallics. Copper and rose gold were popular last year, and as a trend these glinting tones are set to stay. One way to inject the warming tones that those bare brick walls in your industrial styled wedding venue needs, is through gold or copper table decorations mixed with lots of foliage and of course candles candles candles! Did someone say oversized, illuminated letters? Yes, they are quite possibly the most popular wedding lighting trend and yes, you absolutely can include them in your industrial chic theme! Choose options with larger bulbs, metal casings and angular designs for the best effect. An Industrial styled backdrop for the ceremony room is another way to wow your guests with your sense of style and coolness! Go for something big and simple, preferably metal or raw wood with hanging lights or lots of foliage. 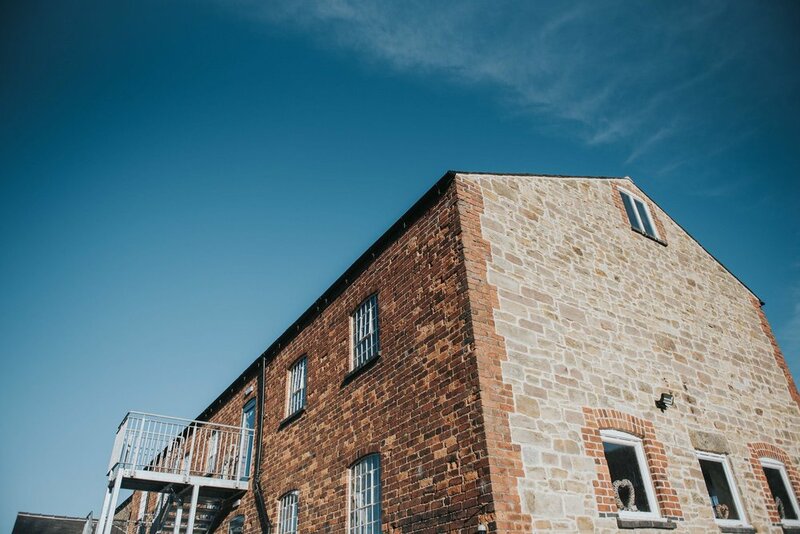 Haarlem Mill, set in the stunning Derbyshire countryside ticks all these boxes and more and for anybody looking for that industrial styled wedding venue in Derbyshire this is a number one choice for newly engaged couples. Our summer open day was a huge success, not only was the day full with lovely future brides and grooms it was also the grand reveal of our brand new upstairs bar and lounge area. We couldn't be happier with how the upstairs bar, lounge and bridal suite looks, it is everything we imagined and more. It feels so surreal to know all of our hard work has paid off and we are now COMPLETE! 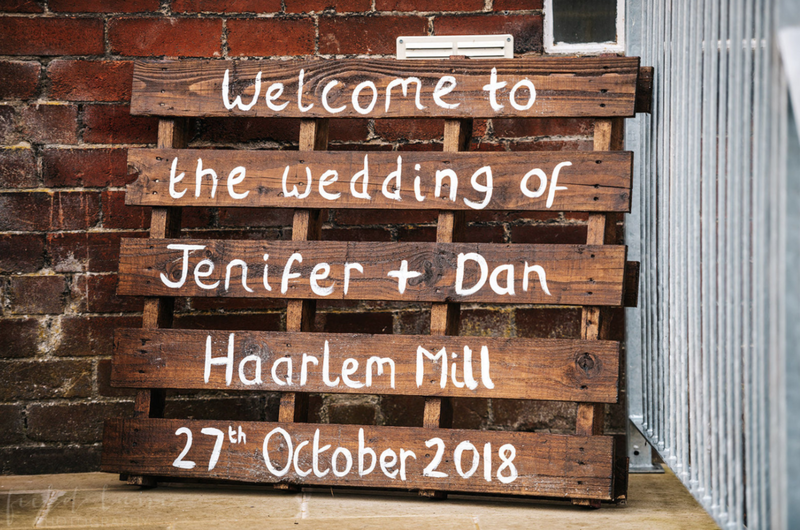 Huge congratulations to the lovely couples who booked their wedding with us here at Haarlem Mill at the open day, we can't wait to start the planning of your special day. Here's a little insight into our Spring open day. 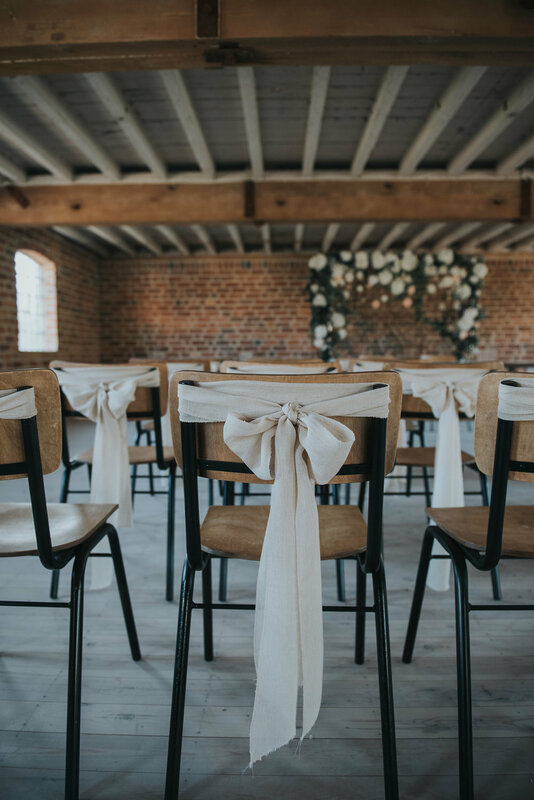 Huge congratulations to the lovely couples who booked their wedding with us here at Haarlem Mill, we can't wait to start the planning of your wedding day.